Ferrofluid is a magnetic liquid, invented by a NASA engineer in the 1960s, that has, in recent years, become a popular medium among scientifically inclined artists. Ferroflow is an interactive desktop sculpture that makes it possible to play with ferrofluid—needless to say, we want it. Creator Matt Robinson calls Ferroflow “a modern day, high tech lava lamp.” To turn it on, you touch any part of the lamp’s anodized aluminum top. A capacitive touch circuit registers the interaction and activates a microcontroller, which causes a powerful rare earth magnet to manipulate the ferrofluid in what Robinson calls “automatic mode.” The mass at the base of the glass housing chamber seems to crackle with life. 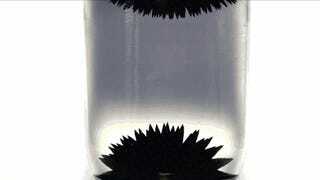 The nanoscale iron particles suspended in the ferrofluid roil through a series of pointy configurations before they are slurped to the top of the vessel. As the magnetic field weakens, the fluid gloops back to the bottom of the chamber. I have a background in electrical engineering and am an artist, so that is where my passion lies. I first saw a video of ferrofluid (the black magnetic liquid) years ago and it really fascinated me so I started working on ways to put it in a display and manipulate it. I saw that others had tried using electromagnets to do this but they are large, heavy, expensive, and use a lot of power. I found that grade n52 rare earth magnets were strong enough to create the magnetic field I needed and then worked on figuring out ways to move such a strong magnet. I finally found a custom servo motor that was small enough and strong enough to move this magnet, and then made a circuit to control it and that’s how it was born. I then made a touch sensor and put in it so if you touch it anywhere it turns “on” and begins moving the fluid around (and you can adjust the speed with the knob). You then touch it again to turn it “off”, and even when it’s off you can manipulate the liquid using the control knob on the front. Robinson has been working on Ferrflow for the last two years. Next week, he’s finally launching it on Kickstarter. Head there (or the Ferroflow Facebook page) to learn more about the project, see more videos, and learn how to score one for yourself.